An unaddressed mold problem in your Laurel Springs, NJ home or business can become a serious and costly problem if it is not properly addressed in a timely manner. Mold presence indicates potentially extensive water damage in your Laurel Springs, NJ property that can prove to be detrimental to the overall safety of the building. Mold caused by major water damage can severely compromise the structural integrity of your residential or commercial property. In addition to structural concerns, mold infestations can cause respiratory problems to those exposed. Prolonged mold exposure can have long-term health implications ranging from mild to severe. If you suspect signs of mold development in your Laurel Springs, NJ home, call a professional to have a proper assessment of your property. If you detect fungal activity in your property, you should consider hiring a professional to complete a thorough Laurel Springs, NJ mold inspection. When it comes to mold, having it resolved promptly, safely, and effectively will help to prevent any further damage. A professional inspection completed, by MasterTech, during the early development of mold can help to avoid a costly remediation in the future. 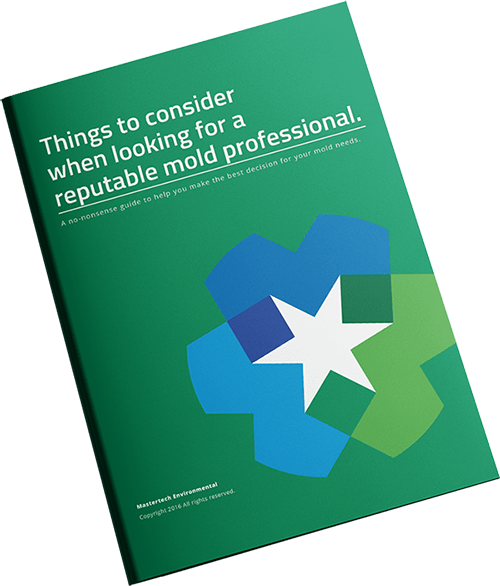 Through a visual assessment to identify the immediate concern, moisture mapping and thermal imaging to diagnose the causation, and the collection of samples for scientific analysis, a trained inspector will be able to develop a detailed report that outlines the full extent of your mold problems. From there, your MasterTech Inspector offer an appropriate solution to safely restore your home or business. MasterTech has taken care to craft an inspection process that will be the least invasive to your property, as to minimize as much risk of cross contamination as possible to clean, unaffected areas. After completing a mold inspection, your inspector will be able to draft a scope of work for your specific mold needs. 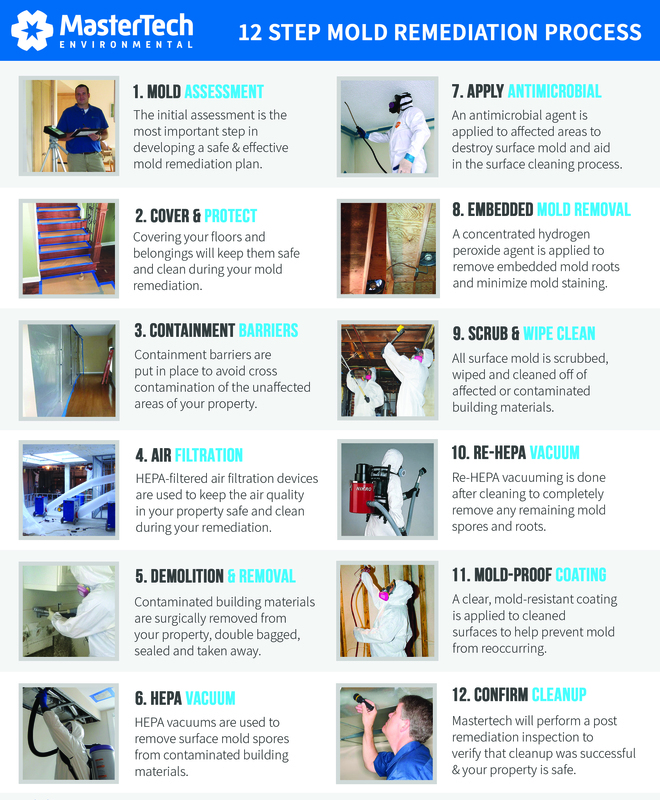 One of the key components of a professional NJ Mold Remediation is prevention. It is extremely important that the underlying water issues causing the mold growth is resolved, as well as thoroughly removing existing mold development. If the water source feeding the mold is not found and fixed, the mold will inevitably grow back, despite a proper cleanup. The most common water sources feeding mold growth: leaks, seepage, flooding, and humidity. Taking the time to diagnose the water source and implementing the appropriate preventative measures is vital to avoiding more costly mold remediation and water restoration further down the line. A proper and thorough scope of work will include all recommendations for preventative tactics that you can implement to avoid future mold growth. To reassure you that your mold remediation was completed properly, each MasterTech mold removal Laurel Springs NJ is backed by a 5-year, mold-free warranty. MasterTech has time to develop a mold remediation process that promises the safest, most efficient, and most effective mold remediation from start to finish. The scope of work for your Camden County, NJ mold removal will include: identification and treatment of all areas of concern, a safe, efficient, and effective cleanup, and recommendations for preventative measures that ensure mold and moisture control in the future. At MasterTech Environmental, we are committed to you and your family’s safety. We pride ourselves in completing the highest quality mold remediation Laurel Springs NJ. Our team of experts have used years of industry experience and research to develop the safest and most effective mold removal process for your NJ home or business. When it comes to your home and family, hiring the right company to appropriately handle all your mold problems can be a big decision. It is important to take the time to do your research and find a reputable mold remediation company that you are comfortable working with. If you detect symptoms of an unaddressed mold problem in your home or business, call us today! For mold removal and mold inspection in Pine Valley, NJ or mold removal and mold inspection in Sicklerville, NJ, call 609-948-8844 will all your questions and schedule and appointment.